Soil compaction is a thief; robbing you of yields by denying your crop of nutrients and moisture. The 4200 Series from Sunflower is the answer. This coulter chisel can completely fracture hardpans and eliminate soil compaction to a depth of 12“. 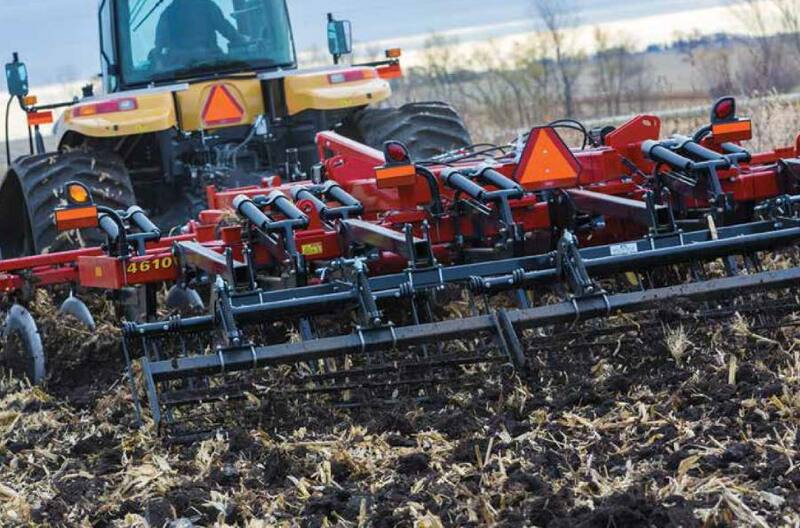 Equip the heavy chisel standards with twisted points and together with the large diameter coulters spaced every 7 1/2" the crop residue is sized and incorporated into the soil for rapid decomposition and nutrient recovery. Frame: Constructed of high strength 4 x 6 x 3/8 -inch steel tube these frames have the strength and the length to meet the draft demand of tough tillage and the ability to clear heavy crop residues. Tongue: The tongue pulls completely through the frame. The attachment point of the tongue to the frame is actually a conjunction of two heavy frame tubes (2” x 6” x 3/8”) and the tongue creating a common pull from the tractor drawbar completely through the length of the frame. This strong design is combined with the two tongue side supports spreading the draft load throughout the frame. Our confidence in this design to eliminate frame stress is backed up by a three year warranty. Shanks: 4200 Series features two different shank assemblies on 15 inch shank spacing. Chose either Auto-Reset shanks with adjustable point load or shear bolt trip protection. The Auto-Reset shank (shown in A) has two point load pressures, 1200 or 1400 pounds for varying field conditions. The Shear-Bolt protected shank is protected mechanically by a 9/16” diameter Grade 5 shear bolt set at a 1400 pound point load. Both shanks are on-edge shank with 30+ inches of under frame clearance and 50 degree point angle. Shovels and Points: There are three options for tillage points. The twisted one piece shovels that are 1/2 inch (12.7 mm) thick and come 3 and 4 inch (76.2 and 101.6 mm) wide with left and right twist and are reversible. Or the 1 inch thick by 2 inch wide heavy duty reversible straight points. Lift Assemblies: The 4213 and the 4233 both utilize walking tandems to prevent frame bounce and uneven penetration. The lift pivot points have UHMW, Ultra High Molecular Weight plastic bearings for longevity and to eliminate greasing. Lift assemblies always mount to a minimum of two frame members to maintain strength and integrity. This type of mount stays straight during field operation and transport, even at the higher road speeds of the newer tractors. Tires: The seven and nine shank models are equipped with four 11L x 15 , 12 ply tubeless tires, 15 inch x 10 inch Six bolt wheels and 2 inch slip-in spindles. The larger size rigid tools, the eleven through seventeen shank models have four 12.5L x 15 , 12 ply tubeless tires, 15 inch x 10 inch Six bolt wheels and 2 inch slip-in spindles. The three section, flexible models feature four 12.5L x 15 , (GY-FI) tubeless tires, 15 inch x 10 inch Eight bolt wheels and 2 1/4 inch slip-in spindles on the center frames. And the wings are equipped with four 12.5L x 15 , 12 ply tubeless tires, 15 inch x 10 inch Six bolt wheels and 2 inch slip-in spindles. Single Point Depth Control: Depth adjustments can made in seconds with the Single Point Depth Control. The adjustment features a spring loaded actuation lever, and depth gauge. Coulter Gang: The Coulter Gang Depth Gauge is visible from the tractor; this gauge is a handy reference tool to determine the depth of the coulter blades and monitor on the go depth adjustment of the gangs. The hydraulically adjustable coulter gangs are equipped with 1 3/4 inch alloy shafts and greasable, triple sealed, trunnion mount bearings. The 20” coulter blades are spaced 7.5 inches with six inch diameter cast spacer spools each weighing 50 pounds. The concentrated weight of this assembly enables the tool to cut through the toughest crop residue and hard packed soils. 3 Bar Coil Tine Harrows: The coil tines level the soil and evenly distributes crop residue. Easily adjusted down pressure and tine angle adjustments. The coil tines are 5/8 inches in diameter and 30 inches long. They’re spaced 12 inches on a common bar producing an effective 4 inch overall tine spacing. Rear Chopper Reels: The optional 16 inch diameter chopper reels are designed with 15 inch long blade sections which are offset one to the next to reduce vibration and provide maximum leveling and residue management. Five Row Spike Drag: The five row spike drag attachment with 11 x 3/4 inch spikes on 1 3/4 inch centers is a simple and effective leveling attachment. The spike bars connected with reversible adjustable links which enable the harrow to be rigid and aggressive or flexible to conform to very irregular terrain.